Addis Ababa (AFP) - Ethiopia has sentenced a journalist to three years in prison, the government spokesman said Tuesday, the latest in a string of jailings of reporters condemned by media rights groups. Temesghen Desalegn was sentenced Monday after being found guilty of defamation and incitement, charges he denies. "All that he did through his newspaper was presented to the court, and the court has interpreted the evidence," government spokesman Redwan Hussein told AFP. "The court has reached its verdict - had the charges not been substantiated, the verdict would have been different." The charges stem from opinion pieces he wrote in 2012 for the now closed Feteh news magazine. Rights groups routinely accuse Ethiopia of trumping up charges as well as using anti-terrorism laws to silence dissent and jail critics. The US-based Committee to Protect Journalists condemned the sentence. "With each journalist sentenced to prison, Ethiopia takes another step further from freedom of the press and democratic society," CPJ's Tom Rhodes said in a statement. "We urge Ethiopian authorities to overturn Temesghen's conviction on appeal and release him and all other journalists jailed for doing their jobs." The CPJ says at least 17 journalists are in jail in Ethiopia, the largest number in Africa except those imprisoned by neighbouring Eritrea. Exiled Ethiopian Journalist Poisoned and died in Kenya. A prominent Ethiopian journalist, Million Shurube, died in Nairobi, Kenya, where he had been in exile since September 2014. Million, father of a son, passed away on 13, October 2014 at Kenyata hospital at the age of 33. The cause of his death is still unclear. Million was one of a dozen of Ethiopian journalists forced in to exile recently having been harassed, threatened, accused, and charged with fabricated terrorism offenses. He fled from Ethiopia on September 2014 to escape from imprisonment. Affectionately known as “Milli”, Million Shurube served as a journalist for more than 10 years. He was the founder and managing editor of a weekly magazine “Maraki”, and had worked for different publications including the now-defunct Abay, Ethiop, and Google newspapers. Million was also the author of a book discussing the deep rooted social problems in Ethiopia. Reports indicate that the journalist got sick 20 days after he left his country, and finally died having suffered for more than 20 days. Some weeks ago, he was told to have got Taifoid at a clinic and used to receive medical treatment. "One Ethiopian free press journalist and"Maraki "magazine managing director has dead in Kenya . The Journalist named Million Shurube died yesterday in Nairobi . He had a connection with one of Diplomat wife from Ethiopian Embassy in Nairobi. She came to his home always @ night and they signed in for dinner Daily before he died . He was a healthy and strong young person . The TPLF Diplomat poisoned his food and The Journalist died ." Temesgen Desalegn An Ethiopian editor is facing as many as 10 years in prison after being convicted of inciting the public against the government through his newspaper articles, his lawyer said. Temesgen Desalegn, the former editor of Feteh, a defunct weekly newspaper, was convicted yesterday by the Federal High Court on charges that also included defaming the government and distorting public opinion, after a case that lasted about two years, lawyer Ameha Mekonnen said. He will be sentenced on Oct. 27. Communications Minister Redwan Hussien said that the conviction was for articles Temesgen wrote for Feteh about two years ago. The case concerned “incitement and misinforming the public,” he said by phone. Ethiopia is Africa’s second-biggest jailer of journalists after neighboring Eritrea as of Dec. 2013, according to the New York-based Committee to Protect Journalists. Government officials say journalists are not above the law and aren’t prosecuted because of their profession. Last week, an Ethiopian court sentenced three magazine-owners in absentia to more than three years imprisonment each on charges of instigating the public to overthrow the government and fomenting ethnic tension. Temesgen was involved with one of their publications, Fact, Ameha said. The trial of six bloggers and three journalists accused of links with outlawed groups resumes tomorrow in Addis Ababa. Temesgen was prosecuted under Article 257 of the country’s 2004 Criminal Code, Ameha said. The provision relates to the “provocation and preparation” of a range of crimes against the state, according to the law. An Ethiopian court banned Feteh’s distribution in July 2012 after it published front-page stories on the illness of late Prime Minister Meles Zenawi and protests by Muslims in Addis Ababa. PUBLISHED ON WEDNESDAY 8 OCTOBER 2014. The three, who fled the country when the prosecution was mooted, are Addis Guday publisherEndalkachew Tesfaye, Lomi publisher Gizaw Taye and Fact publisher Fatuma Nuriya. Their jail terms range from three years and three months to three years and eleven months. Ethiopia’s justice ministry announced in August that it was bringing criminal charges against these three magazines and three other weeklies – Enqu, Jano and Afro-Times. The authorities have been stepping up their persecution of news and information providers for the past several months. Six bloggers and three journalists (including an Addis Guday reporter) have been held since April. After repeated postponements, their trial is now scheduled for 15 October. 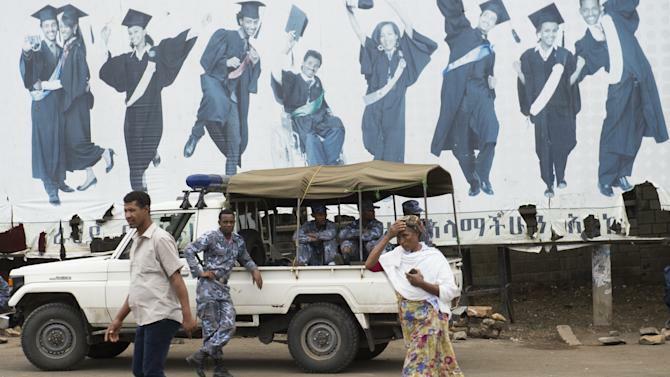 In June, 18 journalists were fired from Oromia Radio and Television Organization (ORTO), the main state-owned broadcaster in Oromia, Ethiopia’s largest region, for supposedly having “narrow political views.” The dismissal order came from the government.